The land to build the church was given by John Barnard resident of Bunwell in 1811. He was one of the original members of the church and is buried in the churchyard. 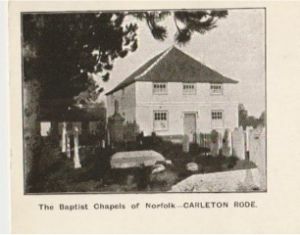 The church was originally established by a group of men who attended Diss Baptist Church but wanted to ensure residents of Carleton Rode and Bunwell could worship according to Particular Baptist principles without having to travel to Diss. The church became independent in 1812. The original church building was a timber frame construction with brick cladding. This has deteriorated over the years and now is in need of extensive repair. In 1852, John Woodrow, a member of the first congregation wrote the following: "It pleased the great head of the church to provide them a convenient and handsome meeting place. A chapel 30 feet square with a front gallery and vestry which was erected at the sole spend of Mr John Barnard on a piece of ground. This piece of ground he gave large enough to include a burial ground and a baptistery situated in Carleton Rode which was duly licensed, put in trust and enrolled in chancery according to Act of Parliament." 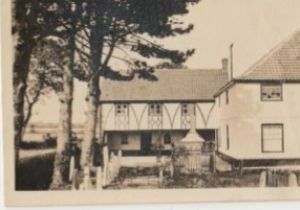 The new venture proved popular in the local community and in a very short time members were considering enlarging the church which seems to have taken place around 1860. Soon after, stables were added. Enough to house 12 horses and so it seems that some regular attenders were affluent enough to have their own transport. The burial ground was extended on several occasions. A visit to the present ground reveals memorial stones dating back to 1814 and family names repeated in different generations. The graveyard is still in use today, for members and their families, and local residents who have a connection to the church. The work of ministry in these villages was successful enough to engage full time ministers throughout most of the church history, although the minute books reflect times of austerity when the minister's stipend was not paid and deacons were required to make up the shortfall! A schoolroom was built above the existing stable block in 1904, which has been used for youth activities right up to the present day and also many other social events. The field was acquired for the church in the 1980s to provide additional parking. The top section near the graveyard has been laid with gravel to accommodate approx 20 cars and recently a special surface has been added to a further area for extended parking for Sundays and larger events. The field has been used by local guide and scout groups for camping and by Christian Caravan Clubs for weekends away. It has been widely used in young peoples work and examples of this are holiday clubs, activity days and youth club. It also makes a very attractive venue for large celebratory events in the life of the church such as centenary events, area conferences, mission focus rallies etc. Following a fire in 2009 the stable block was converted into a coffee shop with a new kitchen and a toilet block. These alterations, whilst built using different construction methods relevant to the era, have been designed to complement the existing style of the building. The old pine pews were removed in 2012 and replaced with chairs. This has given much more flexibility to how we can use the space.